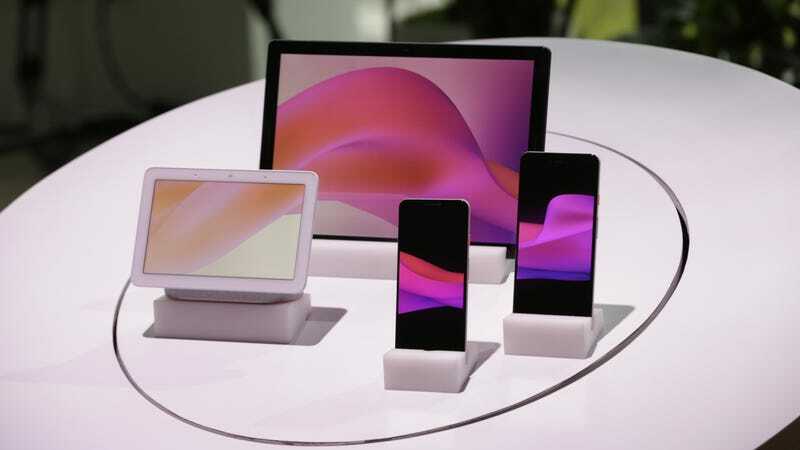 Google’s attempt at a splashy Pixel 3 launch event today may have been dulled by some of the most expansive product leaks in recent memory, but luckily the company had a bit more to talk about than a couple of iterative smartphone updates. Here’s a rundown of everything Google announced today, as well as some of the things it didn’t. If you wanted a pair of fancy, new Pixel Buds or a Pixel Watch, then tough luck, dear friends. Maybe Google will hook you up next time. Surprise, surprise. We got a pair of new Pixels, as expected. Google’s notchless Pixel 3 boasts a 5.5-inch display and will set you back $800 (a premium over last year’s Pixel 2). The larger, notchy Pixel 3 XL comes with a 6.3-inch display and starts at $900—still $100 less than Apple’s iPhone XS. New features include some noteworthy camera upgrades and a hue dubbed “Not Pink.” There’s also an official charging stand, which is more than Apple can say for itself. Google’s newest Chrome OS device is Pixel Slate. The 12.3-inch tablet’s starting price of $800 is cheaper than last year’s Pixelbook, but it’s certainly no budget device. It’s also thinner than the Pixelbook—at 7mm, comes with a familiar keyboard with weird, round keys, and it features a better display—at 293 ppi (3,000 x 2,000 pixels). Google’s first display bolted to a smart speaker is real, costs $150, and it’s available for preorder today with an October 22 ship date. It’s available in a few nice colors (green, pink, dark grey, and white) and comes with one big selling point over Amazon’s and Facebook’s alternatives: built-in YouTube. Absent from today’s keynote was... a whole mess of stuff that would have been pretty neat to try out today. We didn’t get that pair of updated, fully wireless Pixel Buds we heard about. Google didn’t talk about its new, third-generation Chromecast device during the event either, though the company refreshed it anyways on its website with a slightly tweaked design. Also missing were any hints at a Google-built smartwatch, though we were warned not to expect anything new on that front this year.